The Alpha® Ecogrinder is the ideal high performance grinder with a built-in vacuum system. It is designed for continuous production in fabrication shops as well as job sites. The Alpha® Ecogrinder ensures a virtually dust-free environment without the use of an external vacuum system or expensive dust collector. Its unique slide cover allows the Ecogrinder grinding wheel to grind up to the wall. Opening the slide cover exposes the diamond cutting edge without reducing the vacuum effect. When combined with our manual height adjustment flange assembly, the Ecogrinder can accommodate any 5” grinding wheel with a 7/8” arbor. 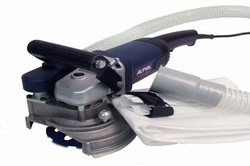 Whether you are grinding natural stone, concrete, or any masonry materials, the Alpha® Ecogrinder is the tool for you!